What’s the most important piece of coffee equipment you own? If your answer was anything other than, “My grinder,” you should probably reconsider. The quality and consistency of the ground beans is the foundation of any great cup of coffee. For that, you need a good grinder. 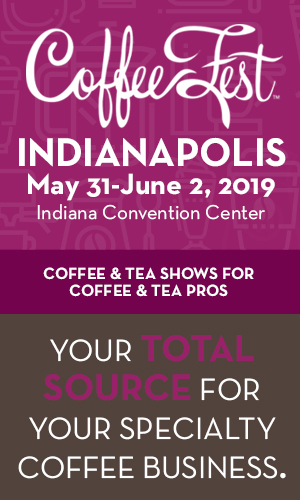 “The grinder sets the stage for what you’re about to brew,” says Steve Rhinehart, brand lead at online retailer Prima Coffee. “If you have an inconsistent grind, it’s going to throw off your extraction. Kyra Kennedy, cofounder of grinder manufacturer Baratza agrees. It’s well known that burr grinders are better than blade grinders, but from there it’s complicated. Not all burrs are created equal. The size, shape, and material of the burr can make significant impacts on the quality of the grind. “Every burr has its own particle size distribution,” says Kennedy. That, in turn, affects your control during brewing. 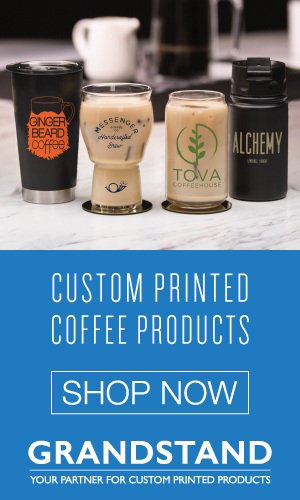 When choosing the best grinders for your café or restaurant you should consider a number of factors, especially this one: what brew method are you grinding for? Espresso requires the finest grind of any brew method besides Turkish coffee, which means your espresso grinder is working a lot harder than your filter grinder to process the same amount of coffee. When you consider that most specialty coffee shops go through more espresso than filter, it’s clear who your workhorse is. You need an espresso grinder that can take some abuse. Espresso grinders can be divided into two camps: conical burr grinders and flat burr grinders. Just like Ford vs. Chevy or Tupac vs. Biggie, both camps have their advocates and detractors. Conical burr grinders, like the ubiquitous Mazzer Robur E and Compak K10, have been the industry standard for years. As the name implies, conical burrs are cone-shaped, with a male and female piece. This allows more efficient, faster grinding than with flat burrs. Conical burr grinders produce what is called a bimodal particle size distribution. This means if you looked at the coffee grounds under a microscope and grouped like-sized particles together, you would be predominately left with two groups: one composed of smaller particles; and one, larger. The smaller particles restrict the flow of water through the coffee bed, giving the larger particles more time to saturate. A conventional espresso recipe is dependent on this slower flow rate. 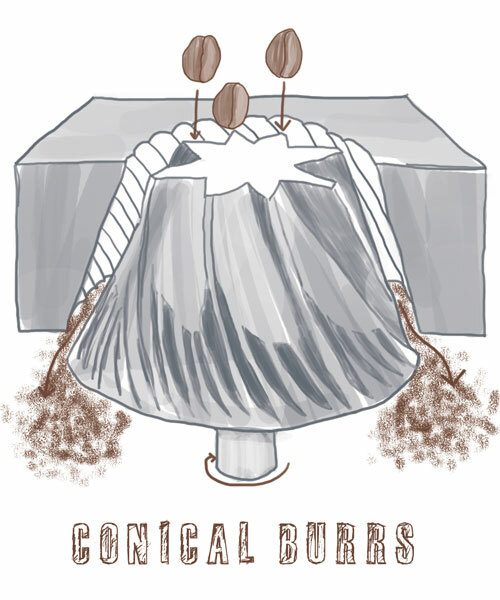 A bimodal grind from conical burrs tends to produce a stronger shot of espresso with more body, something their advocates appreciate. Proponents of flat burr grinders point to the uneven extraction that comes from having two different groups of particle sizes. Different particle sizes will saturate at different rates, leading to differences in extraction percentages between the various particles. Recent years have seen a decided shift toward flat burr grinders. True to their name, flat burrs feature two matching burrs that set flush against each other. This creates a more uniform particle size distribution, allowing the barista to extract more of the coffee without worrying about bitter, dry flavors drawn from finer particles. 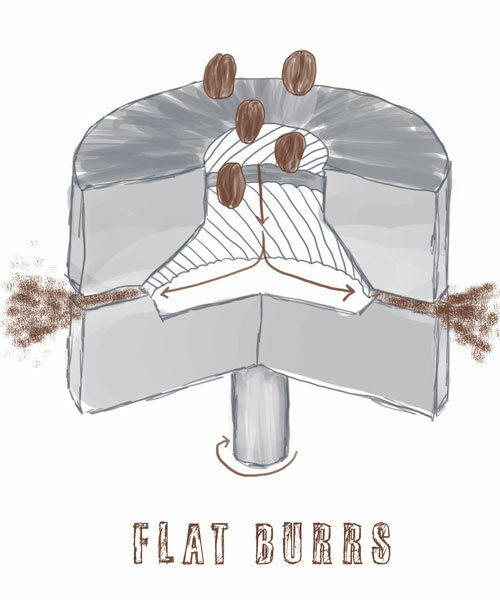 The lack of flow restriction with flat burr grinders, because there are fewer fine grinds, however, forces the baristas to either grind finer (which has its limits) or pull longer shots. The move to much larger shots was made possible by these grinders, and if you’re hoping to break out of SCAA parameters for your espressos, you’ll need a flat burr grinder to do it. 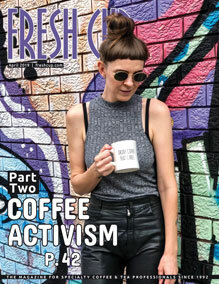 The popularization of flat burr grinders can be attributed to Matt Perger’s 2013 World Barista Championship routine, in which he shocked the coffee world by preparing all of his beverages with a Mahlkönig EK 43. Originally designed as a spice grinder, the EK 43 features gigantic ninety-eight millimeter steel burrs (Mazzer’s flat-burr machines have eighty-three millimeter burrs, for comparison). Those giant burrs help the EK 43 create its unrivaled tight particle size distribution. Whether you opt for a fan or a heater, make sure your house espresso grinder has some sort of temperature regulation. Espresso preparation with the EK 43, however, is cumbersome to say the least, which has opened the door for a new generation of espresso grinders to mimic the EK 43’s larger burrs but in a machine built for espresso preparation. One of the first companies to respond to this new demand was Nuova Simonelli with their Mythos series. Last year, Mahlkönig released the Peak, named for the visualization of a unimodal grind distribution, accomplished here with an eighty millimeter steel burr. Whether or not you choose conical or flat burrs, practically all models of espresso grinders have two obstacles to overcome: temperature fluctuations and grind retention. Friction generates heat, and grinding for espresso creates a lot of friction as the bean is broken down to a finer and finer size. As any barista in the middle of a rush can tell you, the fluctuating temperature of a busy espresso grinder can wreak havoc on espresso parameters. Shot times will speed up as the temperature increases in the machine during the morning rush, only to slow to a crawl once the line dies down and the machine cools. Previously, a popular explanation was that the temperature fluctuation was causing the burrs to expand and contract. This theory has been soundly rejected. Even the hottest grinders don’t reach the necessary temperature to cause steel or titanium to expand. 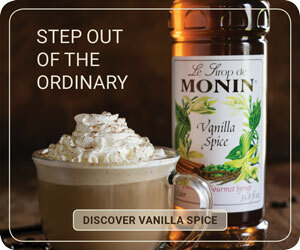 More recently, theorists have proposed it’s the coffee’s changing temperature that produces the difference. Cooler coffee is more brittle, causing more fines to be produced during grinding. Conversely, at higher temperatures coffee beans are more malleable, reducing the production of fines. Fewer fines result in a faster flow rate, thus explaining the change in shot times. Because an ideal grind for filter coffee includes minimal fines, all three companies use flat burrs in their grinders. Whether you opt for a fan or a heater, make sure your house espresso grinder has some sort of temperature regulation. Cheaper espresso grinders without it might pass as your decaf grinder, but you don’t want to depend on them for any sort of volume. An even bigger headache for baristas trying to dial in espresso is the grinder’s retention of grinds. Some of the ground espresso will always stay in the chute and between the burrs. This means whenever you grind coffee, at least some of the coffee that comes out of the grinder was ground previously. Beyond freshness issues, grind retention is also a problem when adjusting settings. Even if you purge two to three doses, you can not be completely sure all of the previously retained coffee has been expunged. As a result, future shots might be a mixture of multiple particle sizes, leading to uneven extraction and increasing the chances of channeling. Although expresso grinders present the greatest challenges, equal thought should be put into choosing and maintaining your filter grinder. Filter grinders grind larger, coarser batches, which requires components built to withstand higher volumes while still providing a precise particle size distribution. “Volume is a big thing,” says Rhinehart. “If you’re brewing a two-gallon Fetco, and you’re brewing a fresh one every hour or more, you need a grinder that can keep up with that volume.” Reinhart suggests checking the manufacturer’s recommended usage, and then erring on the cautious side. “You don’t want to be stuck with a grinder that’s going to break down faster because you’re putting undue stress on it,” he says. For bulk filter grinders, three companies dominate the market: Mahlkönig, Ditting, and Bunn. Because an ideal grind for filter coffee includes minimal fines, all three companies use flat burrs in their grinders. “You can’t go wrong with any of them,” says Rhinehart, who does admit to a preference for Mahlkönig products. At the end of each day, grinders should be vacuumed out and the hoppers should be wiped clean. One grinder custom-tailored for manual brew methods is the Baratza Forté. This flat-burr grinder features innovative grind-by-weight technology that allows the barista to program the grinder to grind a precise amount of coffee. “It reduces the amount of labor time,” explains Kennedy. “And it reduces one thing they have to think about.” Kennedy also sees another use for grind-by-weight grinders. “It’s a great coffee grinder to be used in restaurants and offices. It gives the coffee shop control over how their coffee is being brewed,” she says. After you select the right grinders for your café, proper care and maintenance is essential for proper function and product longevity. At the end of each day, grinders should be vacuumed out and the hoppers should be wiped clean. Periodically, espresso grinders should be disassembled and deep cleaned, as fines and oils will accumulate over time. Be sure to read the manual and contact the manufacturer before disassembling. Café managers should also keep a record of how many pounds of coffee passes through a grinder each year. Different burrs have different life spans, but most busy cafés should plan on changing the burrs of their main grinders annually. —Michael Butterworth is a barista and trainer at Louisville’s Quills Coffee and founder of the Coffee Compass.